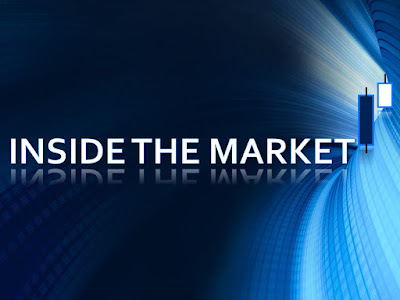 Inside The Market: The management efficiency : cost-to-income of the italian banks. The cost to income ratio is equal to the operating costs divided by the intermediation margin. The meaning is : the lower the value expressed by the indicator, the greater the efficiency of the bank. Usually, the index is expressed as a percentage. Otherwise, the operating expenses are a percentage of the operating income. The ratio is also useful to value the productivity and the profitability for the banks. Here we have a sample : it is the peer group of the main banks, in Italy. In order to have a fair comparison, I used the adjusted results and I used the same criteria with regard to the same period, last year (we speak about the nine months ended on 30th September 2017 and about the nine months ended on 30th September 2016). For further info, please consult the notes below the table (1-7) and visit the section investor relations. The efficiency is substantially the same compared to last year ; indeed, we can see a slight improvement, in general. 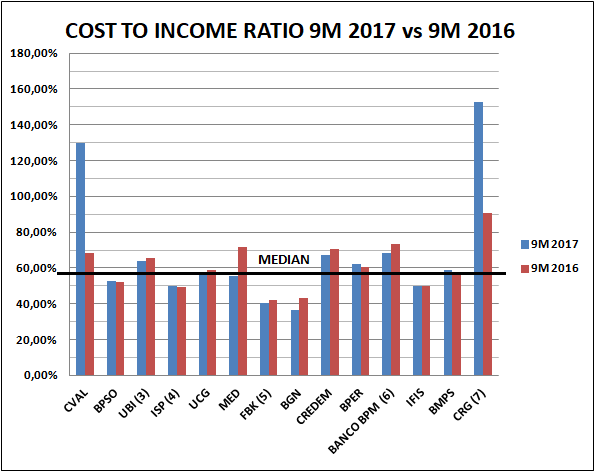 We have two banks that represent the outliers of the peer group : CVAL and CRG ; the ratios had a strong worsening, compared to the nine months of the year 2016. In the same way, we have other outliers (by the positive side), FBK and BGN. However, the two banks have a similar cost/income ratio, substantially, compared to last year. Reasoning by p.p. : by the negative side, about + 60 p.p. ; by the positive side, about from -2 to -7 p.p. (2017 vs 2016). Following the considerations of the previous points, it is more useful to focus on the median than on the mean. See the following table. Finally, the bar chart is much more explanatory. The two period have two colors, respectively, the light blue for the year 2017 and the red for the year 2016. The median is highlighted by a horizontal line. 1) BGN ; 2) FBK ; 3) ISP ; 4) IFIS; 5) BPSO ; 6) MED ; 7) UCG ; 8) BMPS ; 9) BPER ; 10) UBI ; 11) CREDEM ; 12) BANCO BPM ; 13) CVAL ; 14) CRG.